What: BENJI™ was presented at the exhibition called Identifikuj.Me curated by Darija Medic. The work is a collaboration with Mihail Bakalov, Judith van der Made. Other artist in the show: !Mediengruppe Bitnik, Anna Adamolo, Andre Castro, Annemieke van der Hoek, Gordan Savičić, Kara Stone, Linda Hilfing, Marina Božić, Silvio Lorusso, Tatjana Vukelić, Te Yosh. 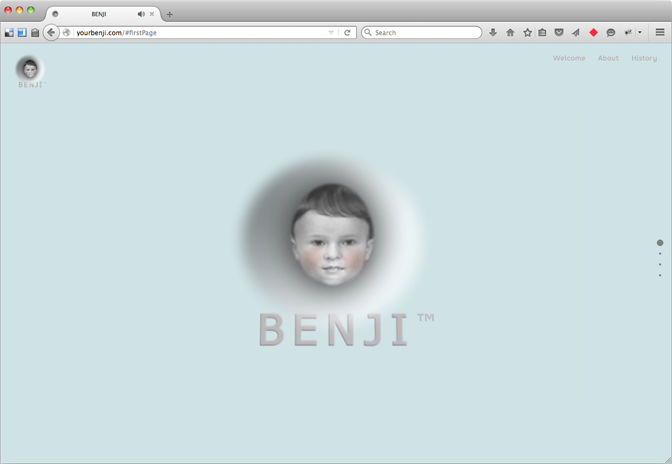 BENJI™ is a fictitious app powered by the ultimate personal information – DNA. The work aims to highlight the ramifications of ever-increasing personalised technology by satirically adopting the commercial visual language and narrative structure of tech start-ups, presented in video form embedded on a website. Set in the near-present BENJI™, is a multinational company invested in intelligent technology determined by ones DNA. It is a speculative fiction that explores the Quantified Self movement through bio-information as a commodity and consequently envisions the prospects of genetic discrimination and the increasing personalisation of marketing strategies. The title of the work is named after the real child of Sergey Brin, co-founder of Google.com and Anne Wojcicki, co-founder of 23andme.com (a privately held personal genomics and biotechnology company). BENJI™ represents the ideological and economic union as historically practiced in royal political marriages and commonly witnessed in corporate mergers. Actors: Dennis de Bel, Nazif Lopulissa, Judith van der Made and Amy Suo Wu.